Comments: Formerly considered a subspecies of the Greenbacked Heron, the Green Heron is currently considered a distinct species with four recognized subspecies. A relatively small, dark, stocky heron, the Green Heron prefers wetlands with thick vegetation. Fish, amphibians and invertebrates comprise their diet. They are known to “bait” prey into closer striking range using a variety of objects, including live insects and earthworms. 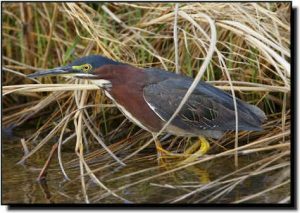 Primarily solitary in their foraging and breeding behavior, Green Herons may nest on the ground or in vegetation singularly, in small loose groups or even colonially. Adults are distinctive with greenish-black caps and wings and rufous-colored necks and breasts. Immatures may be confused with American Bitterns or immature night-herons. However, the smaller size, darker back, neck and wings, longer, straighter bill and slight crest can help distinguish them from other species.